If the Six Million Dollar Man partnered with a Navy SEAL in a CIA / DEA / Etc. 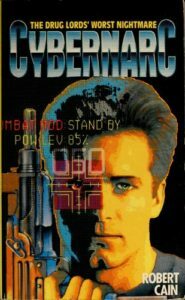 partnership to go around the world assaulting drug-cartel compounds, the results might be a little (a LOT) like … Robert Cain’s Cybernarc. Enticed? Other comparisons await you deep in the bowels caverns of this episode! HINT: if it involves a robot with a human face, we probably talk about it this time around. Our first friend-submitted book in a WHILE, so, uh, Jeremy Fakelastname from Portland … thanks? for bringing the blood and thunder. This one is fairly bonkers, as a whole lot of well-described violence butts up against … not a lot else, if we’re being totally honest. Lots of lists of guns, lots of paranoia about the drug epidemic corroding our cities and corrupting our government, lots of meetings with elderly white men talking tough at one another, taking no guff, and preparing to get rough. If you think you’re ready, if you think you can handle it, then get to the chopper and experience the white-knuckle thrills of a narc, except … cyber.